Our son Austin was born on August 12th, 2005. He was 8 lbs 6oz and 3 weeks early so imagine how big he would have been. I had a normal pregnancy. Austin was doing all the right things for a newborn baby. At five days old we get the phone call that changed our lives… The newborn screening came back positive for something; you need to take Austin to the hospital for tests. As a first time mother I was scared to death. The results from the blood test showed that Austin had a metabolic disorder called Isovaleric Acidemia or IVA. Never having heard of this disorder, I thought the worst. I really didn’t understand what this meant. I immediately started searching the Internet to educate myself on this genetic disorder, IVA. In doing this, it increasingly confused me. We had to see a geneticist, nutritionist, and a genetic counselor and I still didn’t understand what this was or what questions to even ask. After seeing the Dr.’s, I got my hands on anything I can read about IVA and Organic Acidemia’s. Here is the simplified explanation: Austin cannot metabolize leucine. Leucine is an amino acid found in protein. If Austin takes in too much leucine he gets sick. The leucine builds up in his body and becomes toxic. IVA occurs in at least 1 in 250,000 births in the US. People with IVA have health problems that range from very mild to life threatening. In Austin’s case, we sent out blood work to isolate the gene to see how severe his condition is. We just received the results of the DNA tests and found out that Austin has a mild phenotype of the disorder. What this means is that he should be able to tolerate more protein than what we originally thought. We are working with our team of nutritionists to come up with a plan on how to incorporate more protein in his diet. We are keeping our fingers crossed. He is in the 95th percentile for both height and weight. He is not a small child by any means. Austin takes a special formula daily that is a leucine free protein powder. Thankfully he likes drinking his “milk”. Austin is also on 2.5ml of L-Carnitine, which helps remove the isovaleryl-coenzyme A (CoA). Austin gets blood tests every month to monitor his Leucine, Isoleucine and Valine levels. So far the only time his levels are elevated is when he is sick with a fever. There are many similarities between both IVA patients and PKU patients. Both are tested using the newborn screening. This is wonderful in preventing symptoms to appear which can lead to many factors such as mental retardation. Helping people be aware that these tests are available can save babies lives. Who knows it could be your own baby’s life you are saving. Be educated and aware. 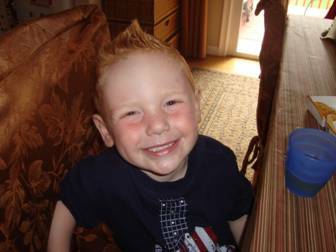 Austin is now four and he is an incredibly outgoing boy. He has tolerated his protein intake beautifully. He is picky when it comes to food, but what kid isn’t picky when it comes to food? His favorites at the moment are french fries and jelly sandwiches. Of course anything sweet is always a hit as well. We are grateful to have such a wonderful and healthy boy. He is a blessing every day and we will continue to educate and help others who face similar obstacles.